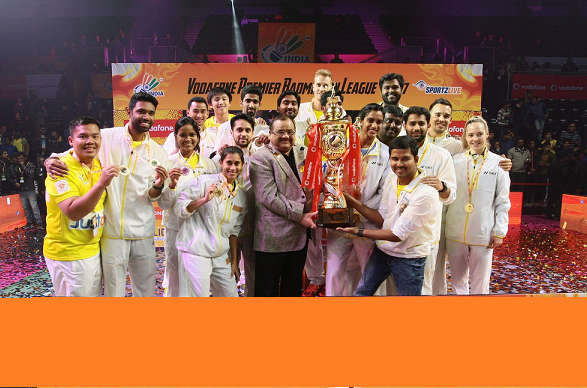 After a journey of 87 matches of 18 matches in 14 days, Premier Badminton League got a new champion in Chennai Smashers. What a journey it has been! The PBL 2017 Tournament started with a 11-2 final set win for Marin vs Sindhu on Jan 1 and ended with a win by 11-3 in the decider by Tanongsak vs Jayaram. For Sindhu that was the only loss of tournament. For Tanongsak, final match was the only win of tournament. In 1st match of the tournament, Chennai lost 3-4, in the last match of the tournament they smashed Mumbai Rockets 4-3. Irony brings glory indeed. What a final it was! Nothing less than a 100 metre high-octane relay race. After multiple ups and downs, including inspirational play of Kashyap, and the Rs 3-crore worth last Singles match of the Final, Chennai Smashers won the maiden title. Premier Badminton League 2017: Schedule and Results, Awards. The finals was like a 100-m high-octane relay race where first Adcock duo and Sindhu handed over 3-0 baton to others to earn just one point from remaining three matches. Then, Mumbai struck back not only winning next two matches to equal the score but also took the first game of the Rs 3 crore match of the tournament. Ajay Jayaram started making mistakes as Tanongsak finally played up to his potential and won the trophy for Chennai Smashers. PV Sindhu and her team ultimately ended up winning Maximum Awards. 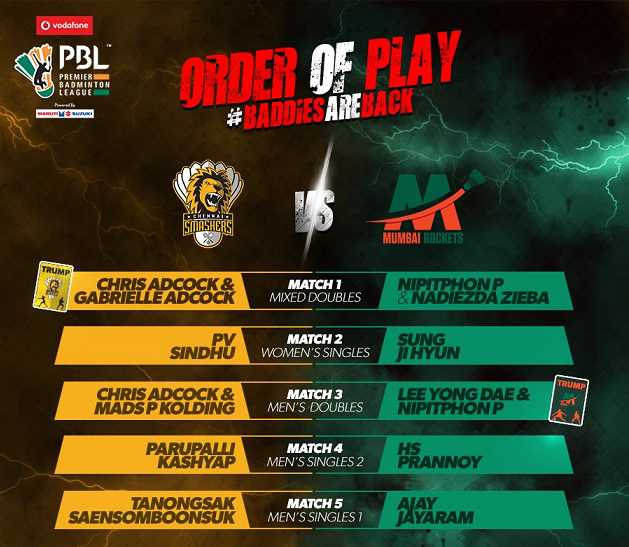 Premier Badminton League 2017 started with a 11-2 final set win for Marin vs Sindhu as Hyderabad beat Chennai 4-3 and ended with a win of 11-3 in the decider by Tanongsak vs Jayaram where Chennai Smashers defeated Mumbai Rockets by 4-3. It was more or less the repeat of their group match where they defeated Mumbai by same margin where the same set of players won and lost. The only difference being instead of Sugiarto, it was Tanongsak who defeated Ajay Jayaram. The dives and grit of Kashyap almost won Chennai the trophy in 4th match but he hurt his shoulder. As a result, Chennai’s only player to have not won any match so far, Tanongsak was asked to get the trophy. He was nervous and lost the first game against Ajay Jayaram. Second game saw his fight back and and third game was just an easy cake as Jayaram failed to raise his game. Tanongsak was shining when none expected. Jayaram failed when all expected it as an easy task for him considering his amazing display in the matches till semifinals. But, Kashyap had to succumb to Super HS Prannoy, who became the most amazing player in three editions of PBL as he won all the 7 matches that he played. 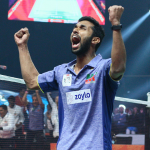 HS Prannoy handed the baton to Ajay Jayaram, who had already won 3 matches before to seal the win. Unfortunately, Mumbai had to stay Runners up for the second consecutive edition. Overall, except the shocking performance of defending champions Delhi Acers, almost everyone and every match exceeded expectation. Bengaluru was unlucky but had the best performances in Doubles, Awadhe Warriors lost the semifinals but their Mixed Doubles team did not lose a match and Hyderabad Hunters were hunted by Mumbai in the semifinals, but till then Marin and co had won the hearts. The entire tournament lifted love for Badminton in India to a new level. PBL 2017 Final: Who Will be the New Champion-Chennai Smashers or Mumbai Rockets!